Beyond Storage | Laundry Room Organization St. Louis, MO. 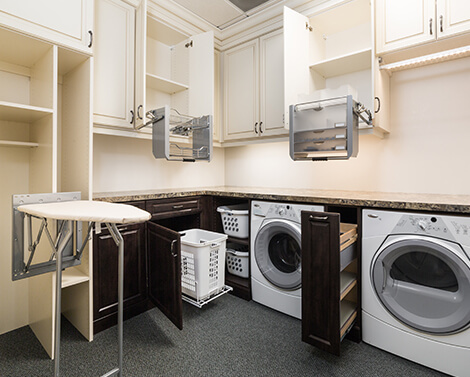 At Beyond Storage, we know how precious excess space can be to your laundry room's organization. That is why we are committed to optimizing your laundry or utility room for complete functionality, efficiency and aesthetic appeal. Our professional design team will work with you in creating a custom laundry area that highlights your family’s individual organization and space needs while streamlining your existing décor. No matter your preference, our experienced design team will work with you to select the appropriate solution that fits your home decor and personal taste, creating the highest functionality for your space. Attractive cabinets and multipurpose cabinet drawers overhead and around your washer and dryer provide additional, out-of-sight storage for your laundry essentials, such as laundry detergent, fabric softener, dryer sheets, stain removers and other cleaning supplies. Cabinets also provide the perfect place to store extra linens that may otherwise get scattered around the house, such as blankets, sheets, comforters and towels. With cabinets tailored to your space, you'll be able to increase storage capacity and functionality. 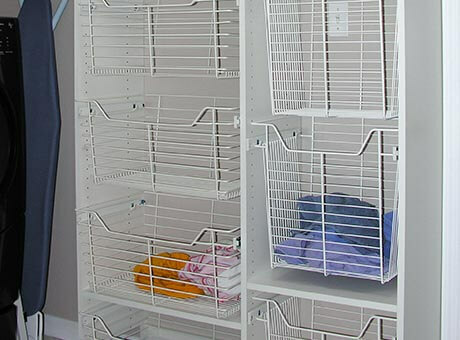 Maintain easy access and functionality with custom pull out shelves from Beyond Storage. Pull out shelves allow you to temporarily or permanently store and organize all of your laundry and utility items in a neat and out-of-sight space. Whether you need shelves to house tall hampers or small baskets, pull out shelves are versatile in that they can be adjusted as your storage needs change. 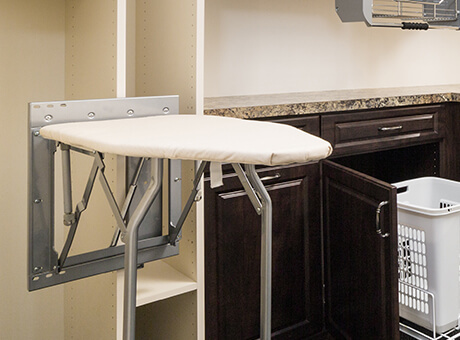 Add space-saving solutions and improve your laundry room's organization with wall-mounted ironing boards from Beyond Storage. Not only do fold-down ironing boards provide optimal laundry room organization, they also offer an easy solution for clothing items that require a quick touch up and they can be conveniently tucked away and out of sight when not in use. 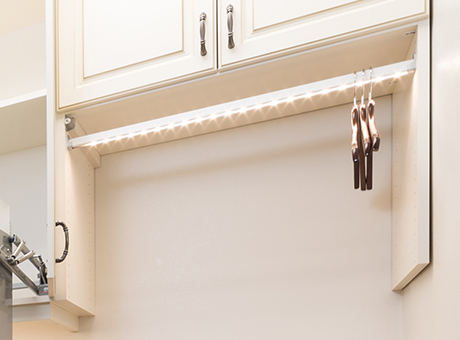 Consider installing a hanging rod under or inside your utility or laundry room cabinets or a valet rod that can easily slide in and out of place for temporary hanging. Whatever solution works best for you, a hanging area is essential for your space. Not only are hanging areas perfect for hanging items fresh out of the dryer to avoid wrinkles, but they are also convenient for wet items, including towels and bathing suits before being tossed into the hamper. In addition, hanging rods can be helpful when ironing clothing, allowing just-pressed items to be hung as you work. 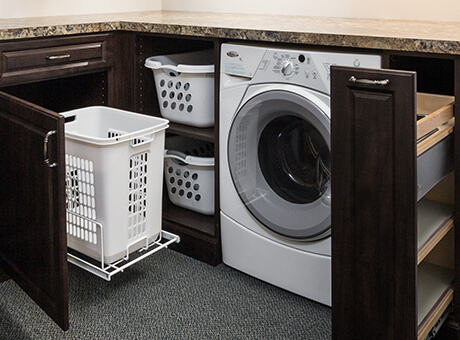 Baskets, bins and hampers are an ideal storage solution for streamlining the laundry process and improving laundry room organization. Whether your goal is to simply and quickly separate your whites, darks and delicate items to conceal mounds of clothing or to store extra laundry room essentials, such as hangers, mesh bags and other accessories, Beyond Storage is sure to have the baskets to suit your needs. Sorting and folding clothes around or on top of washers and dryers is a common, complicated task many homeowners face. This can be easily fixed with the proper accessories and laundry room organization. 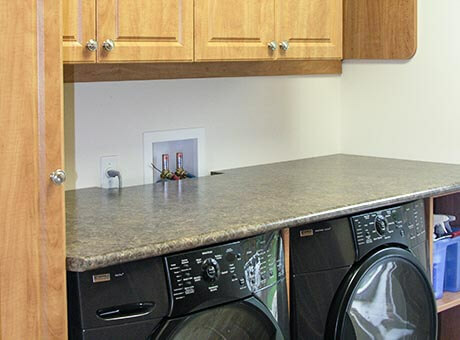 Utilize the space above your front-load washer and dryer by installing a functional, custom countertop. A countertop surface would provide a convenient space dedicated for folding and sorting clean clothes – and pre-sorting used clothes – and linens at ease.